The new season of Reno Rumble sees teams from across the nation competing in an East Vs West battle for renovating supremacy! The first two teams to tackle the kitchen transformations were Dane & Leanne representing the West and Country Girls Sarah & Renee representing the East. Not without drama, the two teams delivered exceptional homes for two deserving families, with these new kitchens now standing proudly as the heart and heroes of the homes. We caught up with the Contestants to find out how they did it — Leanne & Dane on creating a functional Scandi space, and Renee & Sarah on how they nailed the Modern Industrial brief. Read on to find out how the new kitchens have changed the lives for the homeowners. With their new open plan U-shaped kitchen, entertaining and organisation is a breeze with ample workspace and practical storage solutions, all wrapped up with fresh Scandi appeal. “The Caesarstone benchtops are my favourite feature of the kitchen – they are not only lovely to look at, they are really practical and easy to clean. My favourite small feature are the open timber shelves. They add warmth to the kitchen and are perfect for cookbooks.” Sarah also says the two Inalto ovens are fantastic for cooking for a large group. “They make cooking enjoyable again!”. 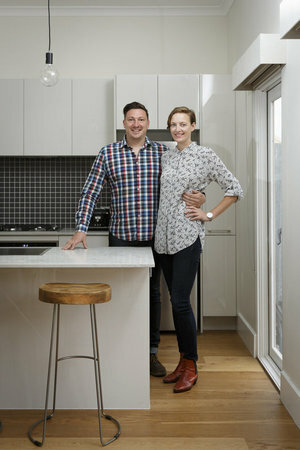 David and Madeleine had struggled for years with their small, dark, claustrophobic kitchen, and wished for a light-filled space where they could entertain friends and family. Enter design duo Renee & Sarah who completely transformed the space in a striking modern industrial kitchen in a monochrome scheme of white and charcoal. 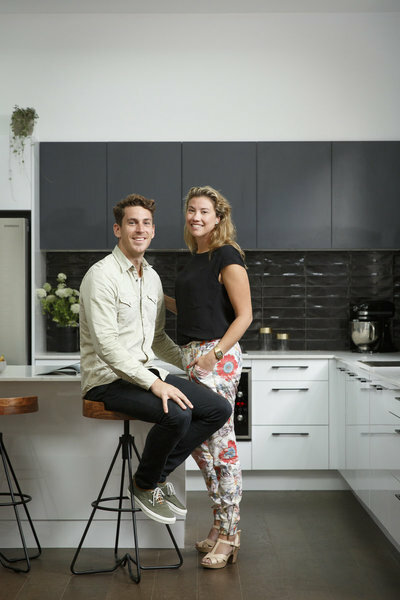 “The kitchen looked incredible when I walked into the room, especially the marble-look Caesarstone island benchtops and appliances which fit seamlessly,” said David, adding Madeleine hasn’t stopped beaming since discovering the integrated dishwasher which topped off a well-planned layout. “We now love spending time in this part of the house, whereas it was a chore before. We can now say we are proud of our kitchen thanks to Freedom Kitchens, and we can invite others to enjoy the space with us,” says Madeleine. We’re already looking forward to another gripping week on Reno Rumble!